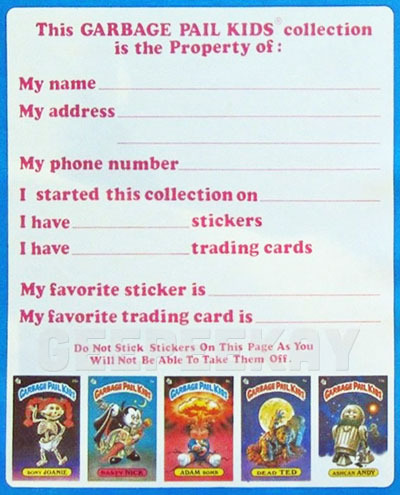 To assist collectors in the storage and display of their Garbage Pail Kids stickers, Imperial Toy Corp. released their 'Sticker Album'. 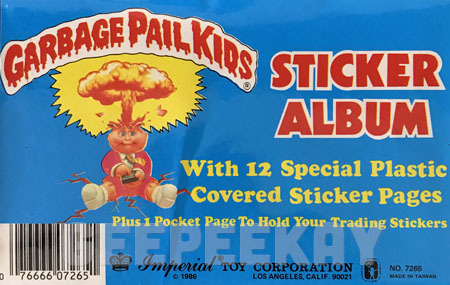 This binder-style album featured 12 full-color pages for peeling and sticking the stickers. 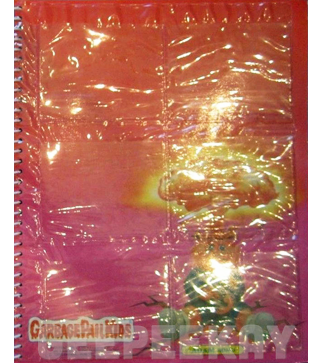 New albums were sold with a cellophane wrapper with an adhesive flap on the top. There was also the inclusion of a small 4" x 6" card that wrapped around the bottom of the album, and featured additional details about what was inside the album. 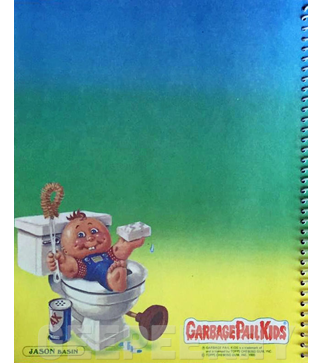 On the inside of the front cover was a 'Property of:' page which was a fill-in-the-blank style sheet designed to 'personalize' the album. 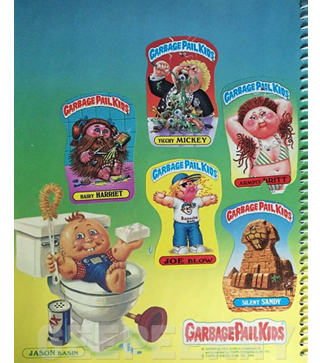 In addition to 5 1st Series card images, it included information such as Name, Address, Phone #, etc...as well as other GPK-related items such as how many stickers were in their collection or what their favorite sticker is, etc. There was also a warning on the page stating that any stickers stuck to it would not be able to be removed. 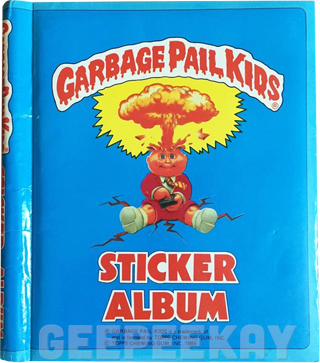 The front of the album featured the iconic Adam Bomb image, while the back was made up of 72 different card images from Series 1 through Series 2, (including duplicates of multiple characters like Adam Bomb, Leaky Lindsay, etc). 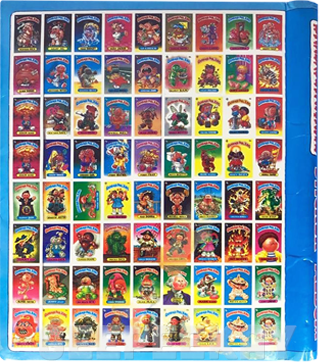 Each page featured an airbrushed background and an oversized image of one of the Series 1 or Series 2 characters. 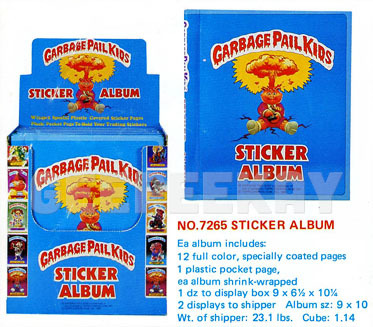 This album was obviously not designed for collectors who wished to keep their cards in MINT condition since it required peeling the stickers from their backing. 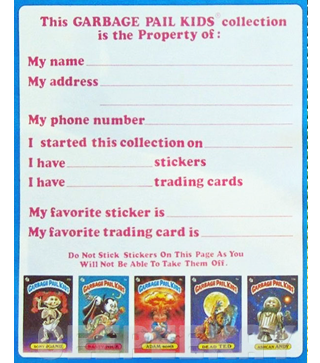 "THESE POCKETS ARE FOR DUPLICATE STICKERS AND CARDS FOR TRADING. ONLY PUT IN STICKERS WITH BACKING STILL ON OR THEY CAN NOT BE REMOVED"